Windows 10 by default doesn't come with .NET Framework 3.5 installed, however some older applications still require it. There is no standalone .NET Framework 3.5 installation package for Windows 10. Instead, you can install it by enabling the corresponding feature in the Turn Windows features on or off dialog. We couldn't check for updates, because you aren't connected to the internet. Make sure you have a cellular data or Wi-Fi connection and try again. Since I couldn't resolve the issue even by following the troubleshooting guide, I resorted to installing .NET framework in offline mode to at least solve my immediate issue. To do that, you'll need a Windows 10 DVD or ISO image. If you installed Windows 10 as an upgrade for Windows 7 or 8, there's a high probability you don't have one at hand. Fortunately, there's a simple way to download a copy using the media creation tool. Just make sure, you select the option to Create installation media for another PC and choose ISO file as your preferred media. 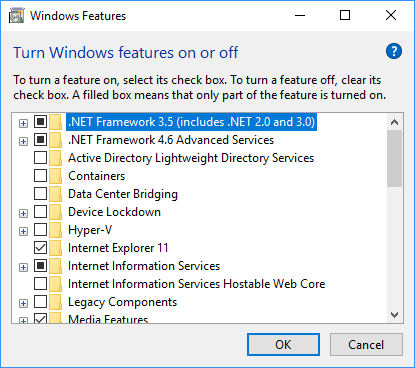 Once the command completes, you can check that .NET Framework 3.5 was successfully installed by reopening the Turn Windows features on or off dialog.